Most western music is in the 4/4 time signature, also known as Common Time. It sounds great, feels natural and allot of the movements we do in our natural lives (breathing, walking etc) could be said to be in 4/4. So why create music in any other time signature? You could say there is no need, as the last century of music produced enough variety from this one time signature so we should be ok for a while longer but, that is also like asking – Why ever eat anything other than a cheese sandwich? Putting aside the obvious health implications of only ever eating cheese sandwiches, the same bland meal everyday would get boring and wouldn’t lead to any inspiration in any other areas of life. Not that my best song writing sessions necessarily come immediately after a meal but ‘variety is the spice of life’ and trying new things (not just food) is essential to creating new and interesting music. Now it’s clear what the top and bottom numbers mean in the time signature we can play around with both and see what happens. Also, don’t forget that such cold analysis of something which could be described as an organic, rhythmic eco-system (I think that balances out the science!) needs to be balanced with a musical approach in real-time. If some time signatures are too hard to play to at first, try clapping or clicking out a rhythm to them – a drum machine is very helpful for this. Anything that helps absorb and understand this new frontier. I’ve put together a couple of transcriptions with some different time signatures and some basic ways to count and feel them. I’ve barely touched the surface in terms of rhythmic divisions and how rhythmic patterns can be grouped within a bar (compound time for instance) so this is more of a basic guide to the dimensions one can play with. I’ve included a ‘counting language’ in the transcriptions. This may seem confusing in the second one as, when a bar ends with a note value of less than a full beat, it can seem ‘jarring’ so, as usual, I would advise a creative approach to learning these – try to create improvisations, small songs and riffs in the harder time signatures and, by all means, invent a new way to count along. Eventually there will be no need as feel will take over. 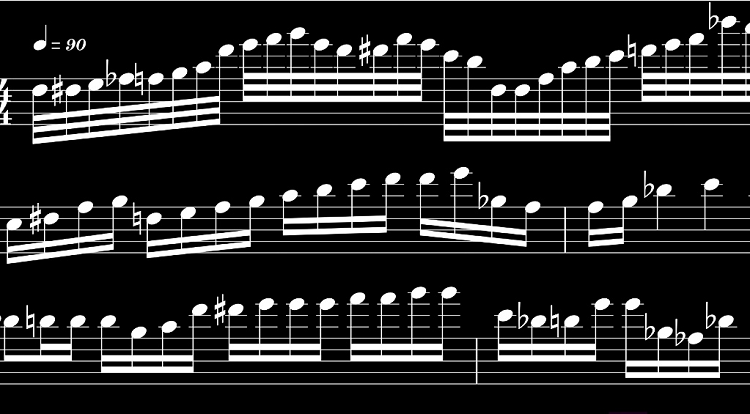 My way of counting could be misinterpreted (in the second transcription) as having the last eighth note, in the odd time signature bars, as being a crotchet as the counting language finishes on a ‘number’ but this is just my way of doing things – I make a point of cutting off my count in practice to emphasize the jarred nature of odd time. 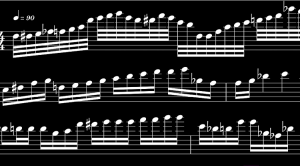 Also, my transcription software automatically puts each time signature into it’s most common note value grouping. For instance 12/8 is grouped as 4 groups of 3 eighth notes but this is not a hard and fast rule. The time signature can be grouped however the writer sees fit.